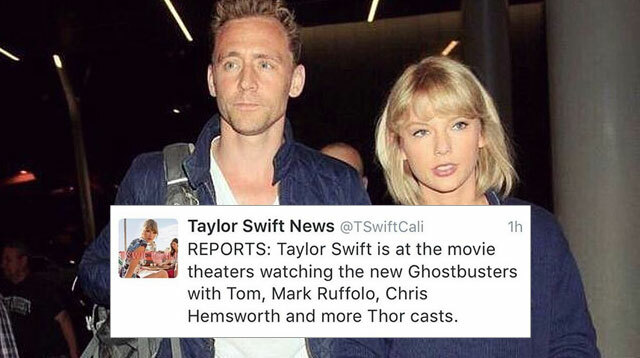 Hiddleswift Go On A Movie Date With Tom's Guy Squad! They just happened to be with Chris Hemsworth and Mark Ruffalo. No biggie. Taylor Swift joined Tom Hiddleston and his Thor castmates for a private screening of Ghostbusters on Thursday night. After actor Tom was inducted into Taylor's infamous squad when he celebrated the Independence Day holiday with her celebrity friends, the roles were reversed as the “Shake It Off” singer met her heartthrob beau's closest friends. Taylor has been in Australia alongside Tom as he is working on Thor: Ragnarok. And according to People, Taylor and Tom were seen by fans arriving at a movie theatre on the Gold Coast in Australia to watch the Ghostbusters reboot, which stars Melissa McCarthy and Kristen Wiig. Chris Hemsworth also appears in the movie as the secretary, and was on hand to watch himself on screen as he joined the group for the night out. Mark Ruffalo, who is once again portraying Hulk in Marvel movie Thor, was also spotted by fans. A source told the outlet that the star-studded cinema group hired out the entire movie theatre and attempted to go unnoticed by sneaking in through the loading dock. The pair's outing came after Taylor's close friend, Victoria's Secret model Martha Hunt, revealed she has given the new couple her approval. "I love that they're both happy and free together," she told People. "It's amazing, I'm all about people being happy in love." Martha was at Taylor's Fourth of July celebrations in Rhode Island, and added that Tom got along "wonderfully" with the singer's friends. Since Tom and Taylor went public with their relationship, there has been much speculation that the romance could be a publicity stunt or perhaps even a set up for an elaborate music video. But as he was interviewed to celebrate his Emmy nomination for The Night Manager on Thursday, Tom did his best to dispel the rumors surrounding his relationship. "The truth is that Taylor Swift and I are together, and we're very happy," he told The Hollywood Reporter. "Thanks for asking." Just to make it clear, Tom emphasized: "That's the truth. It's not a publicity stunt."